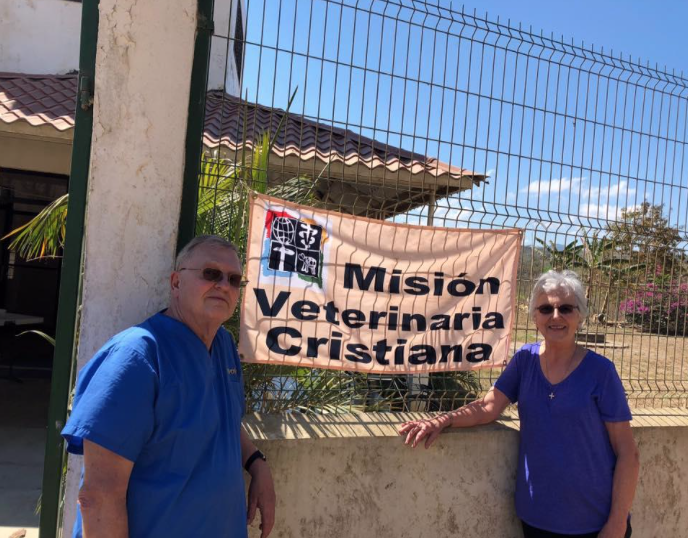 My wife Kathy and I recently returned to Honduras from March 11-24 with a Christian Veterinary Mission team. I have previously led several teams to Danli in southeastern Honduras and Kathy has often accompanied me. 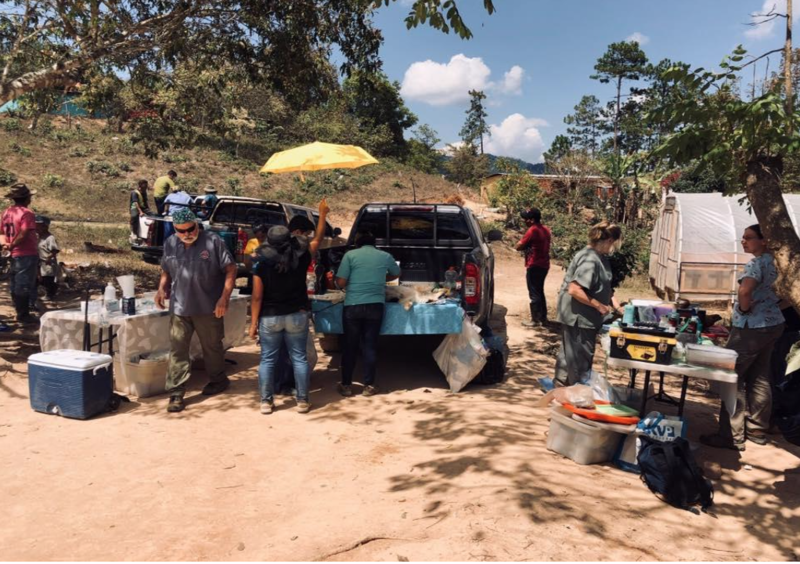 This time we were leading a team of 6 veterinarians, 1 veterinary technician, 5 family members, 3 Honduran veterinary students, 3 Honduran drivers, and 3 Honduran high school translators. 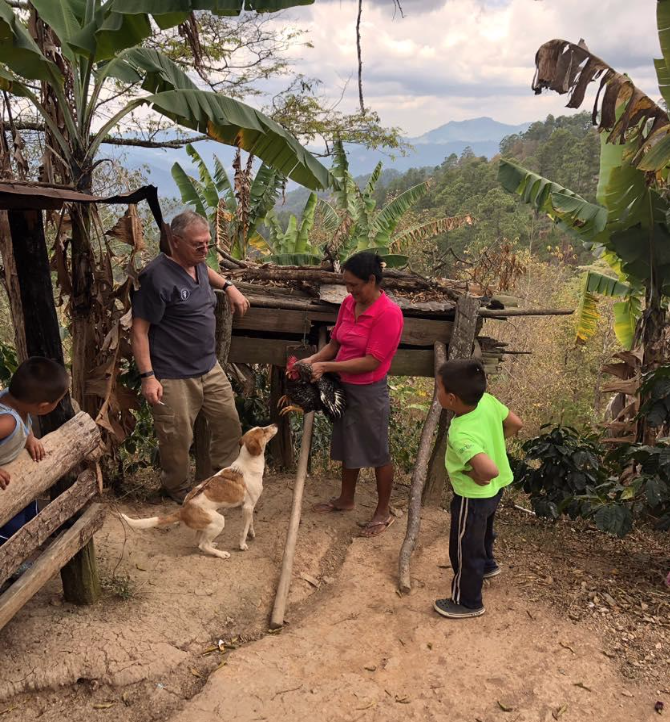 We traveled under the auspices of Christian Veterinary Mission, an interdenominational professional Christian group, and SAMS (Society of Anglican Missionaries and Senders) and were working within the Episcopal Diocese of Honduras to provide veterinary services to animals in the Danli area. Our local contact was SAMS missionary Jeannie Loving. Our team carried in medicines, equipment and supplies. Each team member paid their own travel expenses and we had additional financial support from St. John’s, Franklin, as well as from several individual donations. The team began each day with morning devotions. Then, after breakfast, we would load our gear and travel to one of the many rural communities in the Danli area. Each village that we visited was within the parish boundaries of one of the churches in the Danli Deanery. Upon entering a village our team would divide into a livestock team and a pet animal team. We then provided vaccinations, parasite treatments, medications, and surgeries as needed to horses, cattle, pigs, chickens, dogs, cats and rabbits. The services and medications were provided gratis but the local churches collected a donation of about $0.80 to $1.50 for surgical services. We had some very happy church members as the donations for each church were generally greater than a Sunday offering. In the end we had treated over 1600 animals. always unknown number of hungry local helpers. One spouse organized our daily devotions. Another was a fluent translator. They also helped with crowd control when necessary and were able to help spread the message that we came as Christians and were representing HIM by sharing HIS love. We had purposely scheduled our trip to straddle a weekend so that we could attend church services together in a village where we had worked. This year we attended the new rural church of Santa Maria Magdalena. 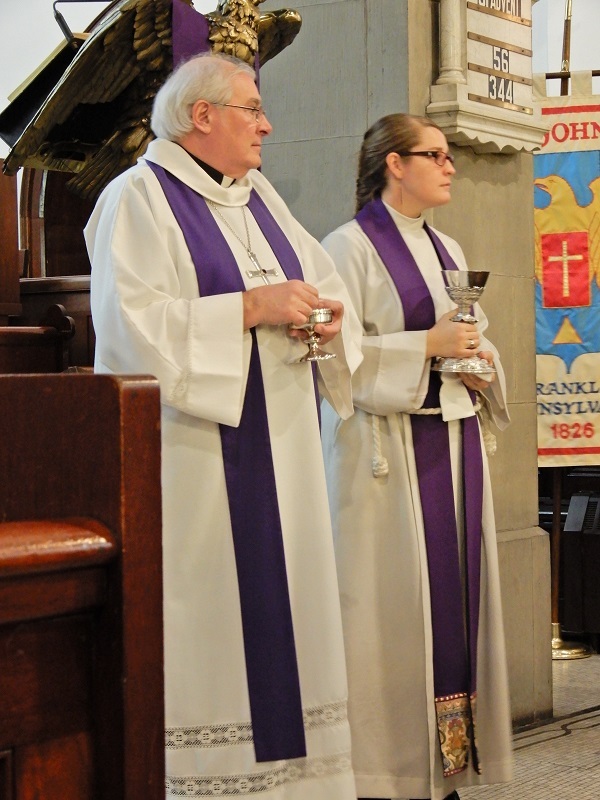 We were fortunate that we were there on a communion Sunday as a priest is only available on alternate weekends. 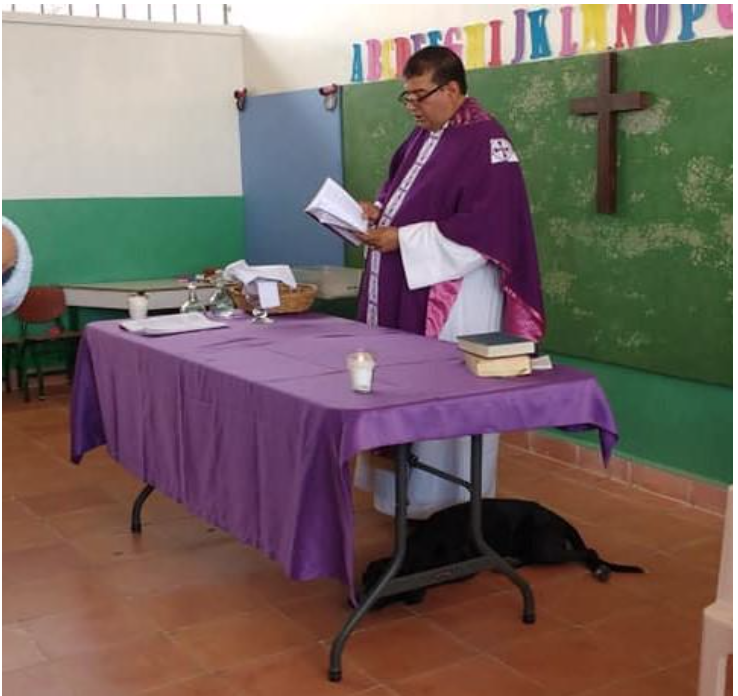 We recognized several faces in the church of people who had been to our veterinary clinics earlier in the week, including one canine patient who walked in during the service and napped under the altar. For myself, the entire short-term mission experience is a spiritual renewal. Yes, the work is satisfying. There is satisfaction in sharing your own resources, your wealth, your strengths, your faith, and all of your abilities with others. We were called to go and share the Love of Christ. Answering that call was a blessing. Dan Paulo is a member of St. John’s, Franklin. Many thoughts as I traveled at 7:30 this morning on my scooter 8 blocks to my last committee meeting… a beautiful, warm day with little traffic… friendly folks along the way. I was a “newbie” on the Committee for Christian Formation & Discipleship but was welcomed by others who had served several times. We had met 10 times and worked to send along several resolutions for consideration to the House of Bishops and the House of Deputies. The days have been full with legislative sessions and other activities. The work is challenging and rewarding. The time has flown by. I’ve learned a lot about diversity and discrimination in our church, as well as much about the good work being done with reconciliation, caring for creation, and evangelism. We have heard testimonies in committee hearings and legislative sessions that were painful and difficult to hear… but also extraordinary stories of grace, courage, bravery and determination. The Bishops’ Anti-Gun Rally and our trip to Hutto Women’s Detention Center on Sunday were eye-opening and heartbreaking. Indeed, time is up! We need to speak up and work to correct wrongs we see being done. As Christians we are called to seek justice, safety, respect and dignity for all people… that includes food, drinkable water and shelter…. together we can do this and more, WITH GOD’S HELP. You’ve heard me say before that General Convention is an amazing experience… I truly wish all of our Diocese could be here to feel the energy. The Church is struggling, but it is also alive and exciting, blessed with strong leadership, and full of people determined to be part of the Episcopal branch of the Loving, Liberating, Life-Giving Jesus Movement! Looking forward to seeing y’all soon! Kaycee Reib is Senior Warden of St. John’s, Franklin, and a lay deputy to General Convention. This post is the eighth and final installment of our “Meet the Deputies” series, introducing our eight representatives to the 79th General Convention. To view other “Meet the Deputy” interviews and follow General Convention coverage, click here. This post is the fifth installment of our “Meet the Deputies” series, introducing our eight representatives to the 79th General Convention. To view other “Meet the Deputy” interviews and follow General Convention coverage, click here. It particularly struck a chord because Robin and I were discussing Stephen Ministry – a one to one lay caring ministry that is based on creating connections between people who are currently hurting and those who have experienced similar situations. From the official Stephen Ministries website: “Stephen Ministry is the one-to-one lay caring ministry that takes place in congregations that use the Stephen Series system. Stephen Ministry congregations equip and empower lay caregivers—called Stephen Ministers—to provide high-quality, confidential, Christ-centered care to people who are hurting.” Stephen Ministers are not counselors, but they are laypeople trained to be caring, non-judgmental, confidential listeners for those in need due to job loss, divorce, grief, chronic illness, or just going through a difficult time. The program began in 1975 when Lutheran pastor Dr. Kenneth Haugk trained nine members of his congregation to assist with pastoral care as ‘lay listeners’. Stephen Ministry has since expanded to include over 12,000 Christian congregations around the U.S. and abroad, including the Stephen Ministry program at St. John’s, Franklin. The group at St. John’s began their journey in 2012. The Rev. 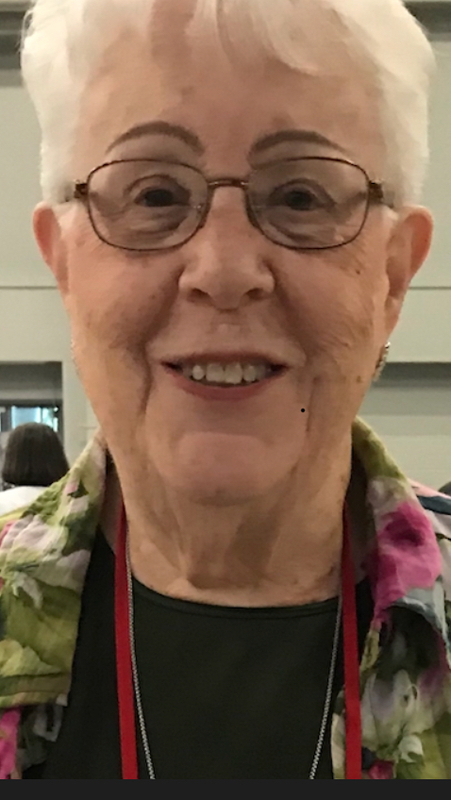 Holly Davis had initially mentioned the ministry to Robin Murray, who already had a leaning toward pastoral care (“I was convinced I was going to be a deacon!”), and told her that it was about matching people up that have similar problems. Robin’s response? “Well, I can do that!” Robin then looked into attending a free seminar about the ministry in Butler with the Rev. Ed Lowrey, Mother Holly and Linda Trikur from St. John’s, and, after Mother Holly spoke to Bishop Sean about the program, they applied for leader training in Pittsburgh. Within three months enough people in the congregation had shown interest that they began training their first group of Stephen Ministers – twice a week meetings for the next four months. While Stephen Ministers are well trained to be lay listeners and caregivers, the thing that really strikes me about the ministry is connection. People who might normally try to “go it alone” are put in touch with people who have been in a similar place, so they can share their feelings openly and be understood on a deeper level than with someone who hasn’t experienced similar hurts. To paraphrase Brené from the quote above, we can both need help and offer help, and this ministry encompasses both sides. I come from a family where it’s strongly encouraged NOT to talk about problems. Over time that approach becomes very isolating, and you assume that no one else has gone through what you have – you’re alone. Stephen Ministry, by pairing you with someone who’s already ‘been there, done that’, gives a feeling of deep connection to those who may well feel like they’re alone in their pain. Care receivers (those who need help) have different avenues available to get in touch with a Stephen Minister. They can contact the church directly, or they may be referred by a friend, family member, or a service professional. Robin has said that the Visiting Nurses Association has occasionally contacted the Stephen Ministry group on behalf of a client who has expressed interest in the program. 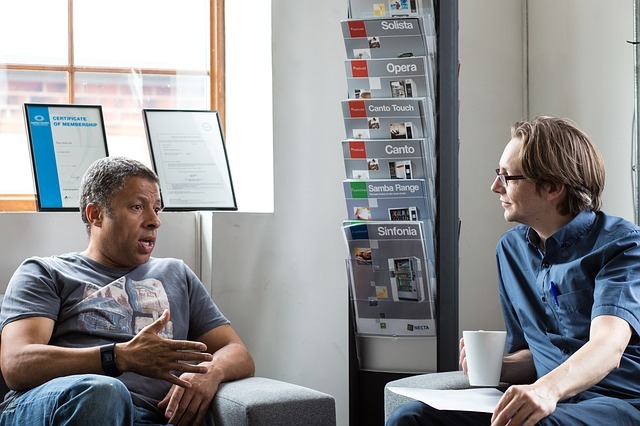 After the initial contact is made with the church or one of the Stephen Leaders, a representative meets with the person and explains what Stephen Ministry is and is not (a caring ear, not a maid/personal shopper/etc). They are then matched with a Stephen Minister within a few days. Meetings are usually once a week for about an hour, either in person or on the phone (though Robin says in one instance they have a care receiver who likes to stay in contact via email with their Stephen Minister when the person is away over the winter months). People are paired women to women, men to men, with similar problems if at all possible, and care receivers must be over age 21 to be put in touch with a St. John’s Stephen minister. One example of how this works involves Robin’s best friend, who lost her son when he was 21 – just a few months before Robin went through Stephen Ministry training. Initially the woman refused to speak to anyone about what had happened, but during a later visit Robin asked if her friend would be interested in speaking with a Stephen Minister. Her friend agreed, and Robin placed a call on a Tuesday to locate a Stephen Minister. Within two days someone was in touch with her friend, and for the first time since her son’s death she was able to discuss the issue. While St. John’s is currently the only congregation in the diocese with trained Stephen Ministers, Robin would like everyone to know that if there is someone in need outside the greater Franklin area, the St. John’s group can put them in touch with other, closer churches who also have a Stephen Ministry program. They network regularly with groups in Clarion, Grove City, and Meadville, and there are several non-Episcopal congregations in the Erie area that have Stephen Ministers available as well. If Stephen Ministry is of interest to you or your church, either as a point of connection for people in need or for discerning whether a Stephen Ministry program has a place in your community, you are welcome to contact Robin Murray (ralfiny@zoominternet.net). We don’t have to do all of it alone. We were never meant to. Megin Sewak is Assistant for Communications for the Diocese of NWPA. A long long time ago… well, at least thirty years ago, two congregations in Franklin decided to do something radical. They decided to prepare for Christmas and Easter together, spending the seasons of Advent and Lent having soup suppers and sharing the Word of God. The radical part about this whole idea is that one congregation was Episcopalian, St. John’s, while the other congregation was Evangelical Lutheran, Grace. Way before the official agreement between the national Episcopal Church and the national Evangelical Lutheran Church on shared ministry, St. John’s and Grace in Franklin were sharing fellowship, bible study, and prayer. Fast forward almost twenty years and that same shared ministry of soup suppers in Advent and Lent was still going on. However, one of the congregations had fallen into some difficult decisions in financial and facility matters. Yet, since the members of Grace Lutheran knew the congregation at St. John’s and were familiar with St. John’s Church, they had an option beyond closing. They decided to sell their building and rent space from St. John’s. After another almost ten years, the relationship between St. John’s and Grace is still going strong. Not only do the congregations share Advent and Lent soup suppers, but now also Sunday School, Adult Formation, an annual Church Picnic, Coffee Hour, Vacation Bible School, and both congregations have members in the Grace Chapter of the Daughters of the King. Joint services are held regularly and almost all the high feast days are celebrated together. Given this great relationship, the clergy, vestry, and council of St. John’s and Grace undertook this past year to put together a document entitled the Shared Ministry Agreement. The Agreement outlines the relationship and shared ministry of the two congregations, while presenting some new ideas to help both congregations move into the future. All this culminated in a great celebration this past December. On Sunday December 17th, 2017, Bishop Sean Rowe and Bishop Ralph Jones joined the congregations of Grace and St. John’s in a special Eucharist which included the signing of the Shared Ministry Agreement, confirmation, and the Blessing of the new Elevator Lift in the Parish Hall. Both the Vestry and the Council stood before the bishops and committed the churches to the development and partnering of this relationship. While we can all thank the Holy Spirit for its work in bringing together the congregations of St. John’s and Grace over the years, the members of both congregations state that the real reasons the relationship has withstood the testing of time and troubles is that we have become one community. The members proclaim, “We are better together,” “We like working together, we like being in community together.” Being a part of Christ’s one Body means working together even when we are different. We strive to live this out as one community made up of Episcopalians and Lutherans in Franklin. No longer is either congregation defensive about which ministry is whose or how they fit together. The reality of the situation is that neither Grace nor St. John’s would be able to follow through on the mission of the church in Franklin without the other. However, together, we are able to follow God’s calling to us in Franklin. The Rev. Elizabeth Yale is Priest-in-Charge of St. John’s Church, Franklin. The newly formed Martha Chapter of The Order of the Daughters of the King was instituted at Trinity Episcopal Church in New Castle on all Saints Day. 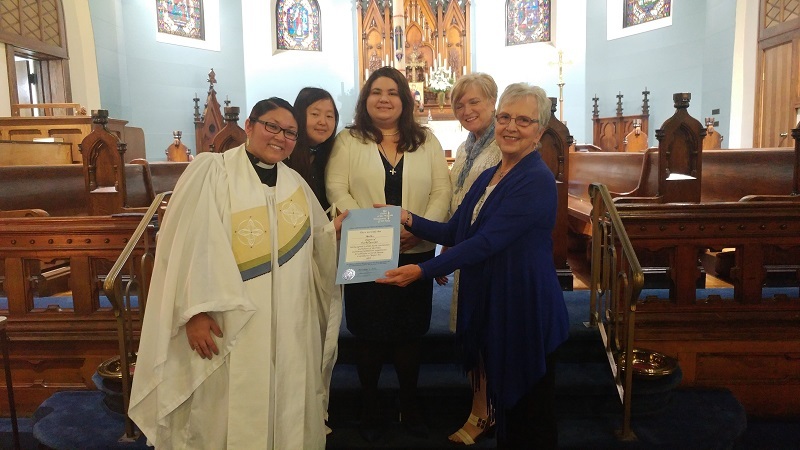 Kathy Paulo, Province III Daughters of the King Vice President, presented the charter to the Rev. Erin Betz Shank. Twelve Daughters of the King from the Diocese of Northwestern PA and the Diocese of Pittsburgh participated in the Services of Institution and Admission. The three new daughters, Pamela Chill, Ashlie Sochor and Laura Betz, completed a three-month discernment period during which they participated in a twelve-part course of study. Their final step was to take vows pledging to live a life of prayer, service and evangelism and to dedicate themselves to the spread of Christ’s Kingdom and the strengthening of the spiritual life of their parish. 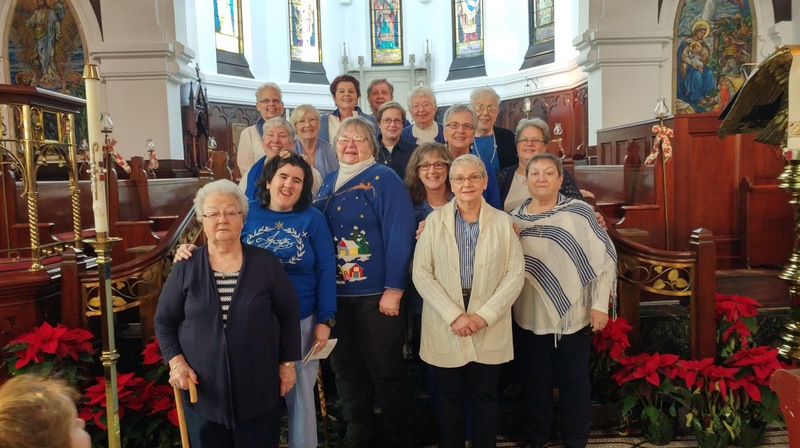 Martha Chapter is the second chapter to be formed in the Diocese of Northwestern PA. Grace Chapter at St John’s in Franklin was instituted in 2005. The Rev. Sean Rowe, then rector of St. John’s, received the charter for the newly formed chapter and admitted six women to the Order. Today the chapter has 24 members, including four women from the Grace Lutheran congregation which shares space at St. John’s. The idea for the lay order was conceived in 1885 by a group of women in a NYC Sunday School class and has grown to include over 25,000 women and girls in the USA and more than 5,000 members in 21 other countries. Though officially an Episcopal lay order, the Daughters of the King has embraced ecumenism by welcoming into its membership women from the ELCA, Roman Catholic, Moravian and Anglican Churches. You are encouraged to consider how a Daughters of the King Chapter could strengthen the spiritual life and outreach of your parish or mission. Kathy Paulo is a member of St. John’s, Franklin. 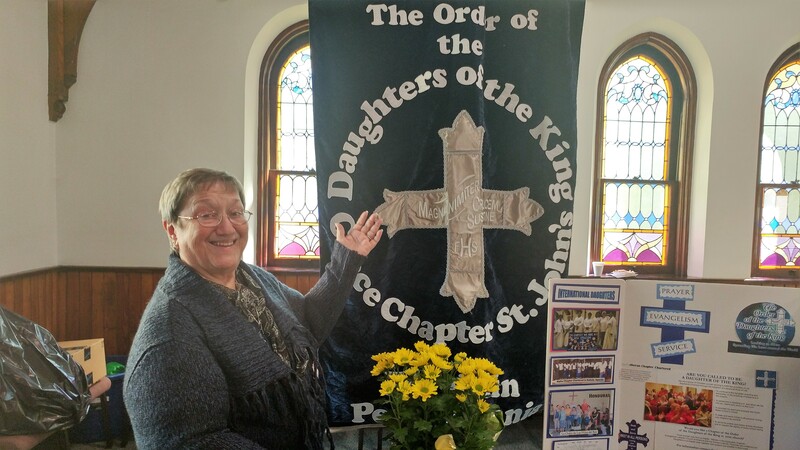 The congregations of the Diocese of Northwestern PA are invited to join the celebration as the Grace Chapter of the Order of the Daughters of the King travel to Trinity Episcopal Church in New Castle on November 5th to institute the newest chapter of their order. The Order of the Daughters of the King is an international lay order for women of the Episcopal Church. New members take vows promising to live a life of prayer, service, and evangelism. Prayer is the foundation from which their service grows, and they are willing to pray for anyone looking for love and help in time of need. It is not a social club, but they are social and like to have fun. However, one does not just pay dues and start coming to meetings. Prospective members are required to complete a study course consisting of 12 sessions spanning 6-8 weeks, and upon completion they take vows promising to follow a Rule of Life. The new Martha Chapter is only the second chapter to be formed in the Diocese of Northwestern PA. 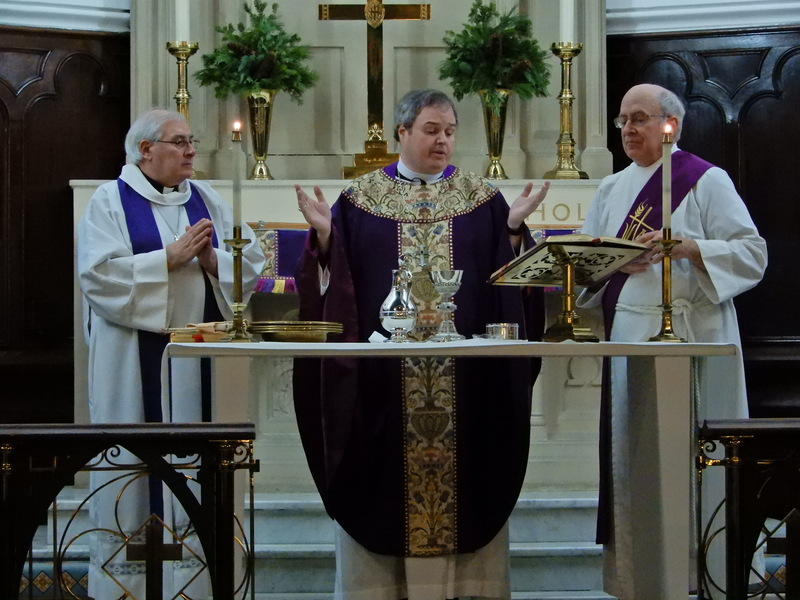 It joins Grace Chapter, St. John’s Franklin, which was established in 2005 while Bishop Sean was rector. Grace Chapter participates in a number of service projects, the latest of which is their Prayer Tent ministry. 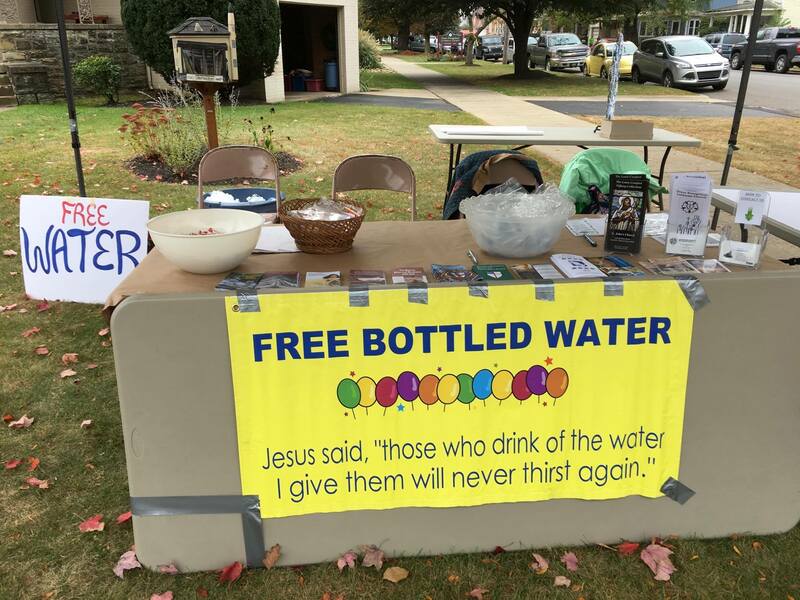 During Applefest in Franklin, they set up a large tent on the St. John’s front lawn, and passersby are invited to stop by for free water and prayer. Prayer requests can be left on provided cards, or people may pray with chapter members in person. Grace Chapter also accepts prayer requests from the church and community throughout the year, as well as participating in projects ranging from collecting Christmas gifts for the residents of Sugar Valley Lodge, sending cards to shut-ins, and AHOY (Anonymously Honoring Our Youth), where adults pray specifically for the young people of their church. More than a dozen women from Grace Chapter will travel to New Castle on the 5th to present the charter during the 10 AM Eucharist. The three women forming the new chapter are very excited, and the congregation is planning a potluck dinner to celebrate following the service.